The eight-day sale of JioPhone 2 comes after introduction of the device by the telecom company in August this year. Two days before Diwali, Reliance Jio launched a limited-period sale of JioPhone 2, the private sector telecom company's 4G-enabled device. The festive sale of JioPhone 2, an upgraded version of JioPhone, commenced at 12 pm on Monday, November 5, according to the company's website - jio.com. The festive sale of JioPhone 2 comes after several rounds of flash sale in the past few weeks. The eight-day sale of JioPhone 2 comes after introduction of the device by Reliance Jio - the provider of telecom services under brand Jio - in August this year. Priced at Rs 2,999, the JioPhone 2 comes with a qwerty keyboard, according to Reliance Jio. Reliance Jio is offering home delivery and cash-on-delivery facilities under the JioPhone 2 festive sale in select locations, according to the company's website. The telecom company has announced an EMI facility for customers to purchase the JioPhone 2 device under the sale. 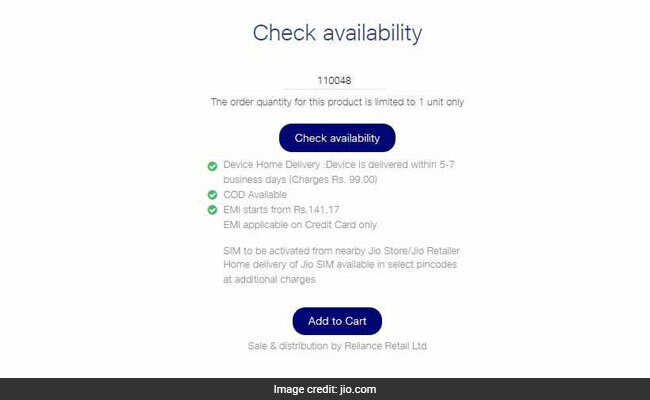 The device is available in select locations at an EMI starting at Rs 141.17, according to the Jio website. “SIM to be activated from nearby Jio Store/Jio retailer… Home delivery of Jio SIM available in select pin-codes at additional charges,” Reliance Jio mentioned on its portal. Users can check availability of the facilities in his or her location by entering the pincode in the given space on the Jio website. Reliance Jio has also announced a cashback of Rs 200 on payment against purchase of the device through digital wallet Paytm, according to the telecom company's website. At present, Reliance Jio provides three prepaid recharge packs for the JioPhone devices: Rs 49, Rs 99 and Rs 153. Reliance Jio offers 1-42 GBs of high speed data, among other benefits, in the three packs for the JioPhone platform. 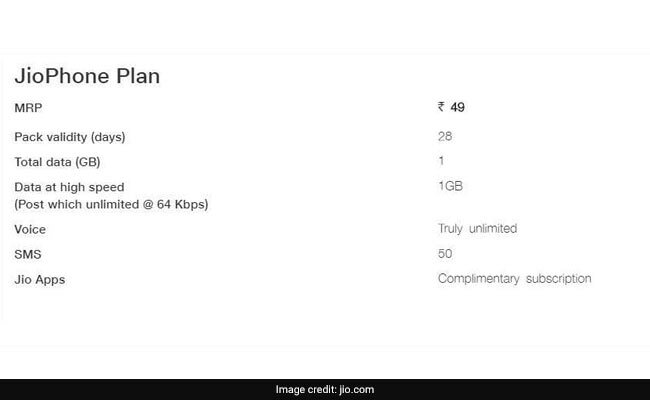 In a recharge plan priced at Rs 153, Reliance Jio provides 42 GBs of high speed data with a daily limit of 1.5 GBs, among other benefits, to the subscriber for a validity period of 28 days. Among other benefits, the Rs 99 plan comes with benefits such as 0.5 GB data per day for a validity period of 28 days (total high speed data benefit of 14 GBs), according to Reliance Jio. That means a subscriber gets 0.5 GB of mobile data at high speed every day during the validity period of this JioPhone plan. Reliance Jio's most inexpensive plan for JioPhone is priced at Rs 49. This plan comes with a total high speed data benefit of 1 GB for a validity period of 28 days. That means the subscriber can use a maximum of 1 GB data at high speed during the 28-day period. 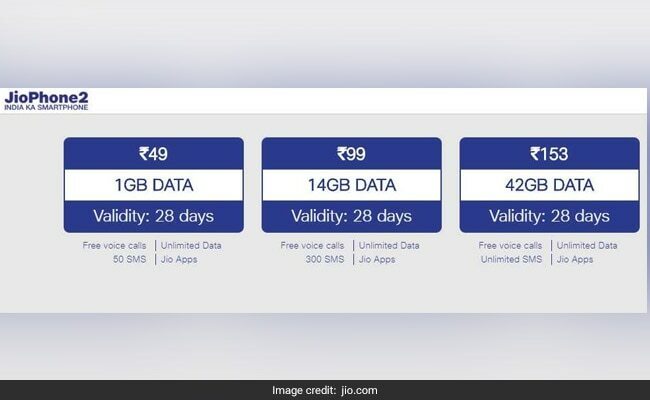 While voice calls are free, just like all Jio plans, this pack allows subscribers to send 50 SMSes free of cost during the validity period, according to the Jio website. In all three plans, data continues at a revised speed of 64 Kbps once the user exhausts the respective limits on quantity of high speed data allowed, according to Jio. Reliance Jio had in September announced introduction of mobile app WhatsApp on the JioPhone platform. 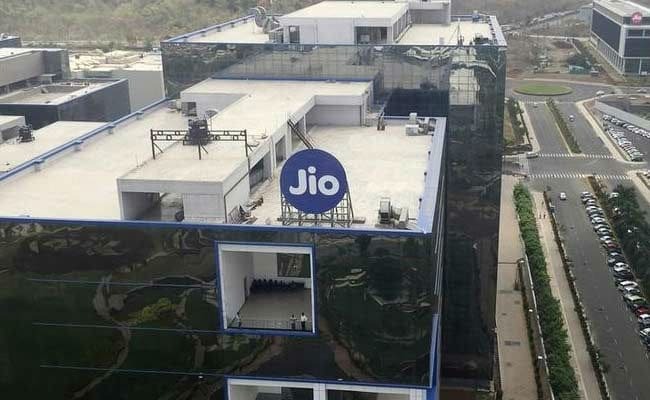 Mobile apps such as MyJio, JioMusic, JioTV, JioCinema, JioVideoCall, and JioPay "come preloaded" on the JioPhone 2 device, according to the telecom company. The customer can also download additional mobile apps, according to Jio.